This book wants to be feminist. Princess Penelope Pineapple, illustrated as a white girl with dark hair and eyes, is the Amelia Bloomer of the Pineapple Kingdom. She has dresses, but she prefers to wear pants as she engages in myriad activities ranging from yoga to gardening, from piloting a plane to hosting a science fair. When it’s time for the Pineapple Ball, she imagines wearing a sparkly pants outfit, but she worries about Grand Lady Busyboots’ disapproval: “ ‘Pants have no place on a lady!’ she’d say. / ‘That’s how it has been, and that’s how it shall stay.’ ” In a moment of seeming dissonance between the text and art, Penny seems to resolve to wear pants, but then she shows up to the ball in a gown. This apparent contradiction is resolved when the family cat, Miss Fussywiggles, falls from the castle into the moat and Princess Penelope saves her—after stripping off her gown to reveal pink, flowered swimming trunks and a matching top. 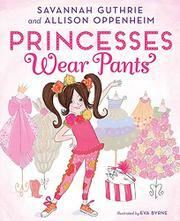 Impressed, Grand Lady Busyboots resolves that princesses can henceforth wear whatever they wish. While seeing a princess as savior rather than damsel in distress may still seem novel, it seems a stretch to cast pants-wearing as a broadly contested contemporary American feminist issue. Guthrie and Oppenheim’s unimaginative, singsong rhyme is matched in subtlety by Byrne’s bright illustrations.